Residents of ward no 7 led by President of the Social Democratic Party of India, Jai Gopal Dhiman, today burnt effigy of the authorities of local Municipal Council (MC). They strongly oppose the setting up of a sewage treatment plant by the MC in their locality. Different organisations staged dharna against indifferent attitude of the state government. Four unidentified youths in a black Lancer car struck four petrol pumps between 8.15 to 9 pm on Thursday. In just 45 minutes they looted petrol pumps situated at Chak Mai Dass, Bahar Mazara, Kahma and Mahalon villages on the Jalandhar-Nawanshahr-Chandigarh highway. They decamped with more than Rs 50,000 cash, two mobile phones and 12 cans of Mobil oil. The Sujanpur police has booked Ashok Kumar under Section 302 of the IPC for strangulating his wife to death at Mirzapur village here today. A person died allegedly due to police torture Fatehgarh Churian police station yesterday. Satnam Singh, Gurnam Singh, Bhatu and Paramjit Singh, resident of Rasoolpur Taprian village, were suspected of a motorcycle theft. They were brought in the police station yesterday. After mercilessly beating a generator mechanic, three unidentified motorcycle-borne youths snatched Rs 20,000 cash, a mobile phone, ATM card, and driving licence from him. The incident took place last night when Naresh Kumar, the victim, was going to his village near Hajipur. Third Shaheed-e-Azam Bhagat Singh Football Tournament and Inter-State Schools Athletic Meet will be held at Government Senior Secondary School ground, Garhshankar, from November 21 to November 25. GPC Nayar, president, All-India Unaided Technical Institutions, was the keynote speaker and Dr J.S. Dhaliwal, president, PUTIA, presided over the event. It was further decided that if the state government did not take enough steps within a week to protect the education sector, the PUTIA would meet again on November 25 to announce the next action plan. the various commercial charges, including change of land use (CLU), external development charges (EDC), commercial electricity charges, commercial transport charges, stamp duty etc. had burdened these institutes. 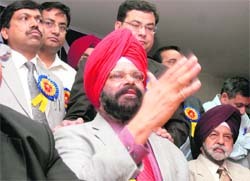 Satnam Singh Sandhu, Chairman, Chandigarh Group of Colleges added that the Punjab government, instead of supporting the institutes, was charging commercial charges of various types. He demanded that the educational institutes should be exempted from all type of taxes so that they can survive and maintain high educational standards. Dr Anshu Kataria, Chairman, Aryans Group said that the PTU corpus fund should be used for the betterment of technical education in Punjab, instead of starting new engineering and technical colleges. If the government does not come forward to protect the industry, the institutes would shut down. Jai Gopal Dhiman alleged that the said locality is already deprived of basic civic amenities. The inhabitants are not getting facilities like potable water, street lights, paved lanes and drains. The MC did not take any positive step in this regard. There is no civil dispensary and government school in the area, said Dhiman. The entire sewerage discharge of the city passes through this area to Bhangi Choe (seasonal rivulet). As a result, the ground water of the area has been polluted making it unhealthy for human consumption. The entire area was stinking and it was difficult to live in the said locality. The setting up of sewage treatment plant would further add fuel to the fire. On account of meagre resources residents of this locality had no other option except to continue living in the area. They have recently written to the Deputy Commissioner, Hoshiarpur, in this regard. They have also written to the Punjab Pollution Control Board in this connection. Activists of Shiv Sena Bal Thackeray led by Sena Leader Inderjit Karwal held a demonstration against price rise and burnt effigy of the state government near local sugar mills on national highways today. In the second demonstration, activists of Ambedkar Sena led by its local president Paras Ram held demonstration in support of their demands and submitted a memorandum to the local Naib Tehsildar, Raj Kumar Nanda. The miscreants also allegedly took the CCTV recordings from a petrol pump station. Jaipal, salesman of Harkartar Filling Station, Chak Mai Dass, in his statement said he and Sajan, another salesman, were present at the pump when the incident took place. He said four youths came in a black Lancer car and asked Sajan to fill petrol in their car. One of them took out a pistol and threatened them. The offenders snatched Rs 7,000 from them. Ajay Kumar, manager of Gurmehar Fuel Centre, Bahar Mazara, stated that four offenders asked Balkar Singh and Deepak Sharma, salesmen, to fill petrol in their car and snatched Rs 7,000 at gun point. They also took the CCTV recordings along with them. Rakesh Suri, manager, Rattan Filling Station, Kahma, said the youths looted Rs 30,000 (approx) and two mobile phones from the salesmen. At Gagan Filling Station, Mahalon, the miscreants snatched Rs 8,000 and 12 cans of Mobil oil, said Gurpreet Singh, a salesman of the station. The police has registered separate cases at Behram, City and Sadar police stations. According to police, Saudagar Chand, the deceased’s brother, lodged a complaint to the police in which he said his sister, Anita Kumari, married Ashok four years ago. Ashok used to beat her as he was a regular drug-addict. He alleged that Ashok in an inebriated condition strangulated Anita on Thursday night. Ashok later told him that his sister has committed suicide. SHO Kuldip Thakur said the accused was absconding and raids were being conducted at suspected hide outs to nab him. Amritsar: The police station Civil Lines here today registered a case on the complaint of a Russian woman, Browichnro Julia, that her purse containing valuable was snatched by unidentified persons. She stated that she was standing out of Ritz Plaza hotel on the night of November 16 when the incident took place. She said the unidentified youth came on motorbike and snatched her purse. She said her purse contained her passport, 500 Russian dollars, credit card, driving license and mobile phone. Police has registered a case under relevant sections. Jagdish Singh and Jaswinder Singh, both residents of Chheharta, stated in their complaint that they lost Rs 12 lakh to four persons and a policeman who promised to sent them to Canada. The accused were identified as Baljit Singh of Dyalgarh Kahnuwal village, Shingara Masih, an employee of Chandigarh Police, Krishna Gupta and Shekh Saleem, both residents of Mumbai. The police has registered a case under relevant sections of the IPC. No arrest was made so far. Later in the evening relatives came to visit them and learnt about Paramjit Singh’s death. Villagers gathered and raised anti-police slogans. The relatives alleged that Paramjit Singh died due to police torture. According to the police, Naresh Kumar, who had been working as generator mechanic at Jammu, was going to his village, Rakkari Datarpur. Due to some problem in his motorbike he halted for a moment. Three youths suddenly appeared and dragged him to the nearby fields where they beat him and snatched money and other valuables. Naresh Kumar informed friend who got him admitted to Civil Hospital, Hajipur. The police has registered a case under Sections 392, 323 and 34 of the IPC. According to Satnam Singh Parowal, General Secretary of the tournament committee, member of Rajya Sabha Avinash Rai Khanna and Deputy Commissioner Dipinder Singh would inaugurate the tournament at 2 pm on November 21.